COLORADO SPRINGS, Colo. (Jiji Press) — The Japan Aerospace Exploration Agency (JAXA) is preparing to announce by the end of this year its participation in a U.S.-led project to build a manned base in a lunar orbit, its president revealed Monday. JAXA President Hiroshi Yamakawa suggested the idea in an interview with Jiji Press. “We’re thinking that we’ll actively contribute” to the project, Yamakawa said. Japan has strong expertise in manned space missions and in transportation of materials to space, honed through cooperation with the International Space Station, he said. JAXA wants to incorporate its participation in the project into a government policy by collaborating with the science ministry so that an announcement can be made by December, he said. 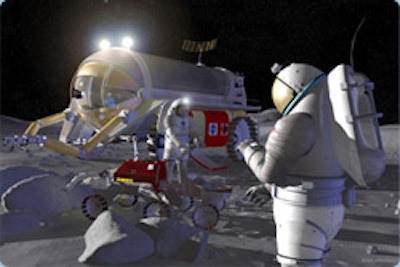 The United States aims to carry out manned exploration of the lunar surface within five years and plans to construct the manned base in a lunar orbit through multinational cooperation. The proposed base, Gateway, in an elliptical lunar orbit is expected to pave the way for detailed exploration on the surface of the moon and also serve as a transit point for future Mars expeditions, succeeding the ISS. NASA aims to start construction work in 2022, with Canada already clarifying its commitment to the project. Japan, Russia and the European Space Agency are considering joining the project. In the meantime, China has launched space resources development in earnest. In January, it succeeded in landing an unmanned vessel on the far side of the moon as the first country to do so.